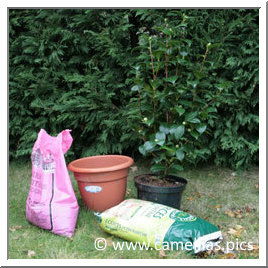 Here is, in some photographs, how to repot a camellia. Either because you will cultivate it definitely in container, or because it will wait for spring and its final place in the garden. Margaret Davis will be used as model. Choose a container slightly larger (2 cm diameter moreover) that the former one. 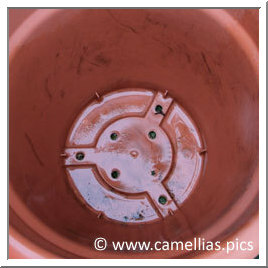 Take care that the bottom of the container is bored with many holes, do not hesitate to add some if necessary. At the bottom of the pot, a little fine bark of pine is enough. Put neither clay balls (worst), neither stones, nor sand. The drainage is very important. 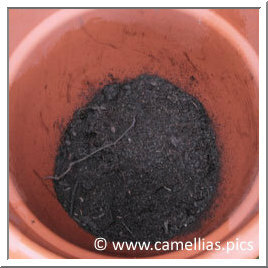 Start by putting a small layer of compost in the bottom of the pot. Soak the mound before placing it in the container. 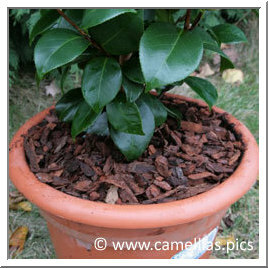 Add compost without burying the mound. Do not forget that it will pack, you will be able to add some after watering. Sprinkle copiously and check the drainage of the pot (that can take a few minutes). Mulch with fine bark of pine (one finds some in small bag). The bark protects the compost and keeps it wet. 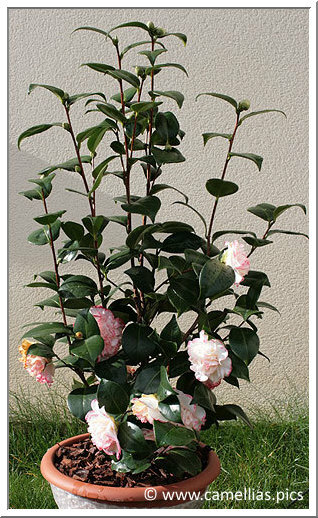 It is useless to put fertilizer, the camellia has some in sufficiency (small yellow balls on the surface of the mound). 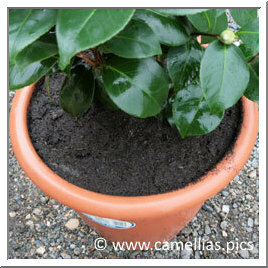 Here is your repotted camellia. 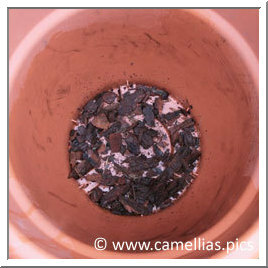 For the winter, if it must remain outside, surround the pot with plastic (with air bubbles) and take it inside the cold nights.